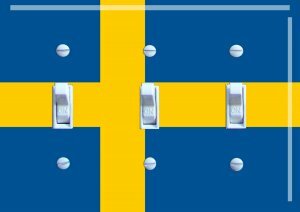 This switch plate is a mini print of the SWEDISH flag. A standard single plate, about 2 3/4" by 4 1/2". A standard double switch plate, about 4 1/2" by 4 1/2". A standard triple switch plate, about 6 1/2" by 4 1/2". Screws are not included unless you let me know that you want them (you can just use the ones you take out of the wall). Each one is packed in a clear bag (which makes them nice for gifts).